CORNER BROOK, N.L. — Braden Calvert was offered a ready-made excuse. The defending champ was having nothing to do with it. Manitoba third Kyle Kurz, right, calls sweeping instructions to his teammates as New Brunswick skip Rene Comeau, top, and third Andrew Burgess look on. 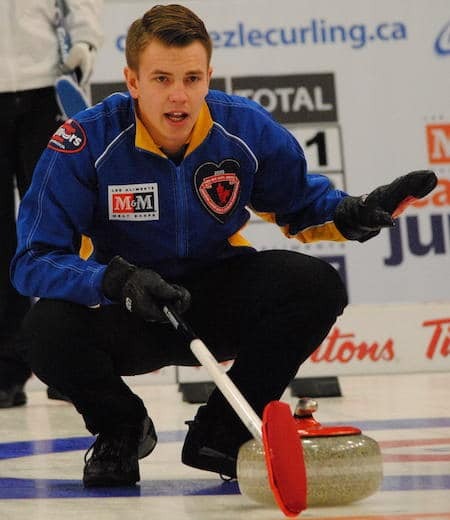 Having given up a steal of one to New Brunswick’s Rene Comeau in the fifth end when his last-rock hit attempt to score three overcurled on Wednesday night at the Corner Brook Civic Centre, it was suggested to the Manitoba skip, and defending men’s champion at the M&M Meat Shops Canadian Junior Curling Championships, that his last rock had perhaps caught some debris, resulting in the miss. But instead of dwelling on the miss, which gave New Brunswick a 3-1 lead, Calvert’s Manitoba squad from Winnipeg — third Kyle Kurz, second Lucas Van Den Bosch and lead Brendan Wilson — listened to some coaching wisdom from coach Tom Clasper. Which is pretty much what happened. 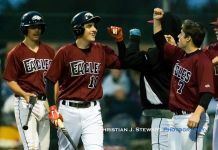 Calvert, who finished the game shooting 89 per cent, tapped for a game-tying deuce in the sixth, stole one more in the seventh and finished off with a 10th-end deuce for a 6-4 win over New Brunswick in a rematch of the 2014 gold-medal game at Liverpool, N.S. Comeau said the priority for his Fredericton squad is to leave Wednesday’s disappointing loss behind. In other men’s Championship Round play, Tanner Horgan’s Sudbury team prevailed in the Battle of Ontario, as Northern Ontario cruised to a 10-4 win over Ontario’s Mac Calwell (Belleville; 2-5). Horgan stole deuces in the first and eighth ends in the victory to improve to 3-4. Also, Alberta’s Karsten Sturmay (Edmonton; 6-1) stole a single point in the seventh end, and deuces in the eighth and ninth ends for an 8-3 triumph over B.C.’s Paul Henderson (Victoria; 5-3). In men’s Seeding Round play, Nova Scotia’s Matthew Manuel (Halifax; 3-5) scored an 11th-end deuce for an 8-6 win over the Yukon’s Joe Wallingham (Whitehorse; 2-6). On the women’s side, 2014 bronze-medallist Mary Fay of Nova Scotia (Chester) won her Championship Round opener, improving to 5-2 with a 9-6 win over Quebec’s Émilia Gagné (Jonquiére/Alma; 4-4). The Bluenosers broke the game open with a stolen deuce in the fifth end, and a score of three in the seventh. In the women’s Seeding Round, Prince Edward Island’s Veronica Smith (Cornwall; 4-4) scored one in the 11th end for a 6-5 triumph over Northern Ontario’s Krysta Burns (Sudbury; 3-5); while the Yukon’s Bailey Horte (Whitehorse; 3-5) knocked off Newfoundland/Labrador’s Sarah Hill (St. John’s; 1-7) 9-7. 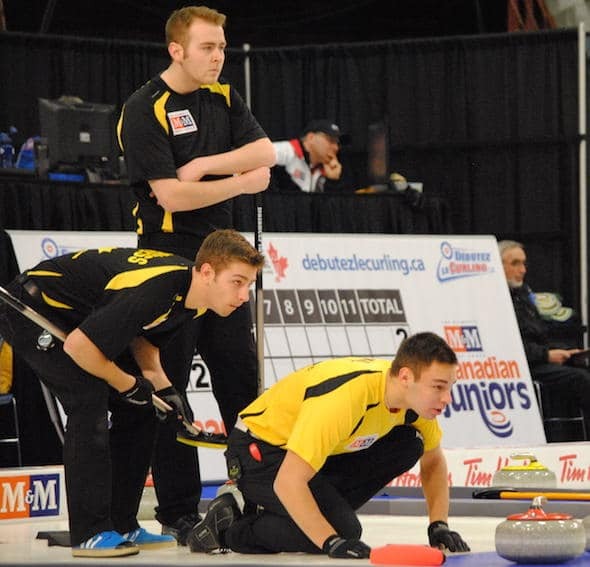 Action at the 2015 M&M Meat Shops Canadian Juniors continues on Thursday with draws at 10 a.m., 2:30 p.m. and 7 p.m. (all times NST; EST plus 90 minutes).